Victoria, British Columbia, Aug 23, 2011 – The Leader of Canada’s Official Opposition, Jack Layton, has died at 61. I had met Layton when he was still a member of the Toronto City Council in the early 90’s. He was thoughtful, rudite, engaging, intellectual and humanitarian – an activist consumed by environmental public policy. Jack was passionate about everything. He should have been the Prime Minister of Canada. But it was not to be. On January 23, 2006, the morning of the then Canadian federal elections, before I got my own Atlantic Eye column, UPI published one of my last columns as an Outside View Commentator. 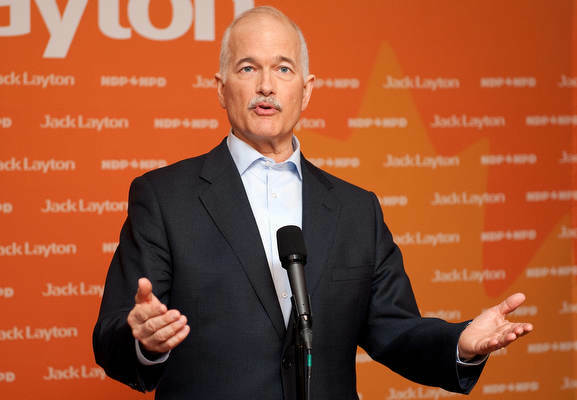 In the column titled, Jack Layton Who?, I predicted that NDP leader Jack Layton would be the big election spoiler. Five and a half years later, on May 2nd 2011, Jack Layton, a Professor, former left-wing city councilor and deputy mayor of Toronto, would send a tsunami through Canadian politics by moving his party, the New Democratic Party, from 29 to 102 seats in only two federal election cycles and bring them to be the Official Opposition – Her Majesty’s Loyal Opposition as it is officially known in Canada. This would be like the Tea Party movement of the United States – albeit a movement of the right – bumping the Democratic or Republicans into third place as a political force in federal elections. Layton had been open about his prostate cancer, but had mostly hidden the later effects from the Canadian lectorate. Then in late July, a gaunt Layton appeared at a press conference in Toronto to announce that some form of cancer was consuming him He refused to say what form it took. And, as in the election, he skirted details about what was killing him. What marked Jack Layton was his genuine desire to make Canadian politics consensual and nonacrimonious. It wasn’t just his desire. He practiced it. It wasn’t just that the NDP campaign of May 2011 saw Layton be the least contrarian, the least offensive and the least divisive of all the Canadian prime ministerial candidates. His brief time as the Official Leader of the Opposition saw him seek consensus amongst all Canadian political parties. Layton did nearly bring down the Canadian government in December 2008, by signing an unprecedented opposition agreement with the Liberal Party and Bloc Quebecois. But Prime Minister Stephen Harper dissolved parliament reventing it from meeting – thus preventing his minority government from being toppled. Of course Layton was in fact a contrarian, but he seemed to do it with words of hope and acts of optimism. He was known for his affable smile and seemingly endless energy. While, his opponents accused him of grand-standing, he was in fact quite comfortable being around normal people. He derived energy from simply being with the Canadian common man. He would sing on stage, he would poke fun of himself and politics. He seemed so genuine, that even his critics began to come around to the fact that Layton was simply a “genuine kind of a guy”. Yet, it was his closing words which defined the man. Jack Layton inspired many Canadians.